Vilnius, capital of Lithuania – what a beautiful city. Our hotel the Panorama is situated within a 10-minute walk of the Old Town. This consisted of cobbled streets with churches, shops, cafes, galleries, the Town Hall, Cathedral, Palace of the Grand Dukes, the Presidents palace, a castle and other places of interest. Such differing variety in such a small area. Not to mention the lack of crowds, clean streets, no ‘sirens’, no hawkers, and two very tranquil rivers. One even had a pedestrian bridge. With hot sunny weather for most of the time, it made it a wonderful place to host the 15th European Heart and Lung Championships. 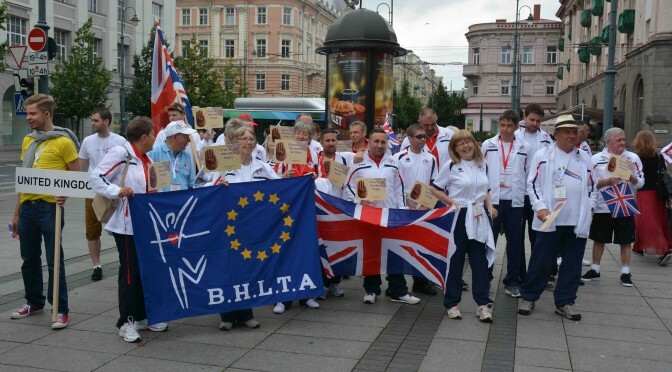 We began with the parade of participants through the streets of Vilnius on Friday evening. Each countries team members proudly marching behind their National flag and banner. 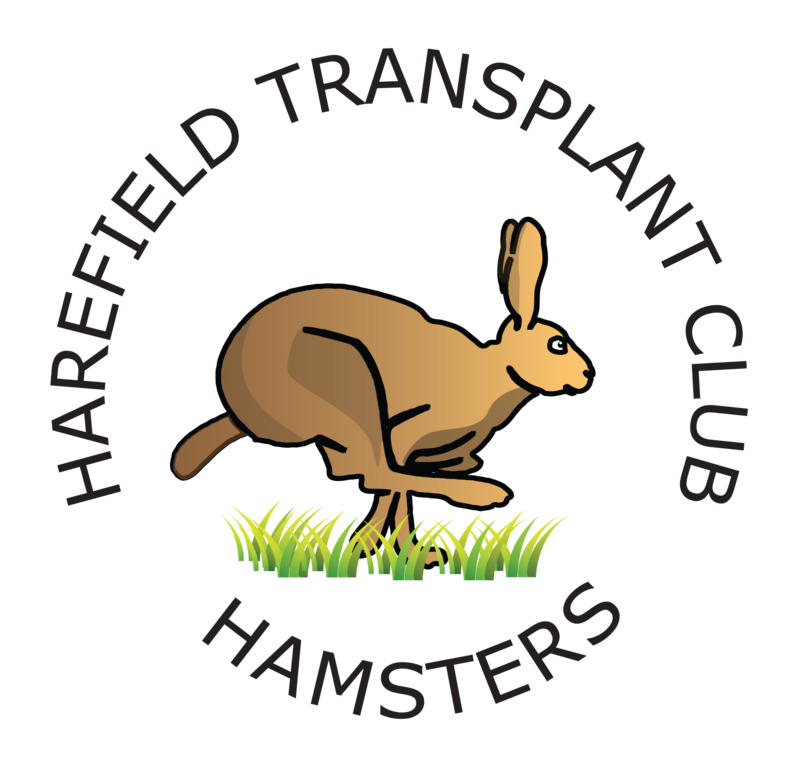 Each transplant was also asked to carry a special sign in both English and on the reverse in Lithuanian saying, “I live with a donated heart” or “I live with donated lungs”. This was intended to have an impact on the public who lined the streets. The hope that many more people would agree to organ donation. Following the parade, we crossed in front of the Cathedral square and eventually entered the Grand palace. Seated at tables, by Country, we watched a local dance troupe perform 15century and 17century dances in costumes of the same period. The Opening Ceremony began with an address from the President of Lithuania, Dalia Grybauskaite. Then Lithuania’s original heart transplant surgeon, who now 88 years old, performed the first heart transplant operation 27 years ago. Next the current Head of Cardiac Surgery Centre in Vilnius University Hospital, Virgilijus Tarutis who welcomed all guests to the Championships organised by the Lithuanian Association GYVASTIS. Ugne Sakuniene, Chairman of the Local Organising Committee, followed him. She welcomed all participants to Vilnius and included a special welcome to the competitors who were taking part. Finally, the Chairman of the European Heart and Lung Transplant Federation, Brendan Gilligan declared the Championships open. Participants were then treated to a traditional Lithuanian buffet of meat, fish and vegetables. When all the food had gone, at the sound of a fanfare, four very strong cooks brought in a cake measuring one metre by half a metre. It was so delicious that it was eaten very quickly. At 11.00 o’clock, coaches took us back to our hotels where once again old frienships were renewed and new ones begun. Sunday morning came all too soon for some, but this was Day 1 of the events. Swimming, Volleyball and Table Tennis. We had only one competitor in Table Tennis, Mark Allen who won through to Gold in the singles. The Swimming event was held in a 25m pool, which none the less proved adequate for everyone. A competent set of timekeepers, judges, and officials kept the schedule moving and on time. We had seven in the GB Team. Each race provided its own blend of excitement and determination. All of our team started winning medals from the off. Notable winners were, Bill Noble 5 Gold’s and Julie Kirby 4 Gold’s and 1 Silver. 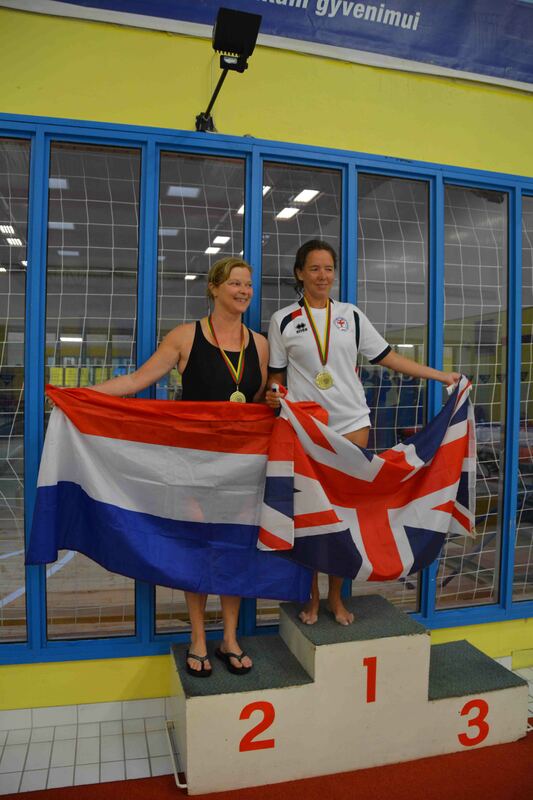 Both Julie and Lynda Morrison swam in the ladies relay with two girls from Sweden against a strong Dutch squad, eventually winning quite easily to get Gold medals each. John Coyle at his first European Championships entered his first swimming event the 100m freestyle with high hopes. Having dived in John was quickly into his rhythm but alas found the effort harder than he had expected. He still won a Silver medal. His wife Shirley suggested he might try 50m next time as it means she has to worry for less time. Medals were presented by a former female Lithuanian Olympic swimming champion. Wow! Our Volleyball team did what they did last time in Apeldoorn in 2012. Played each match with increasing skill and courage only to be piped once again into 4th Place. Next time…. During late afternoon, a special Tree Planting ceremony was arranged in the gardens at the University Hospital Santariskiu Klinikos. The gardens surround the children’s wards and already include a number of wooden sculptures. It is a favourite place to be calm and to recover. The newly planted tree was a cutting, taken from a local 40-year-old Magnolia. It now has a special place in the grounds and we are all invited back each Spring to see it in bloom. After dinner at the hotel many people went out to watch the World Cup Final on a big screen in the Town square. Monday dawned bright and sunny and coaches took most of us to Vingis Park for firstly Cycling 20km and then the Cross Country 4km. GB had 6 in the Cycling, 5 men and a female competitor, Vicky Pettersen, for whom these were her first European Championships. The venue was superb. A huge outside amphitheatre gave great views but was always in the sun. The special marked track though the park was 5km long so cyclists had to complete 4 laps to complete race distance. With not a cloud in the sky and the temperature soaring up to the 30-degree level, the competitors started. After a short burst from Simon Ripley who led for a few hundred metres, a young Swiss, Michel Stuckelberger went into the lead and just flew off into the distance. By the end of the 20km race, he was almost half a lap ahead of his nearest rival. Water was handed out as cyclists went past the star/finish straight although practising catching a bottle of water at speed takes some practice. Heat and lack of water causes dehydration as a couple of our team found out. Thank fully everyone stayed on their bike and enjoyed themselves. Our lone female, Vicky, did very well achieving Gold at her first attempt. Well done. After lunch came the Cross Country. Again held in Vingis Park but using a different course. GB had 9 taking part in this event. With the sunshine and the heat, it was a gruelling run. Again, all of the GB Team won medals in their various age categories, except for ‘Woodie’ who had to pull out with shin splints and cramps. Meanwhile while we were enjoying ourselves in the Park, our single competitor in the Tennis, Paul Kirsop did well and won a Silver medal. Tuesday saw everyone heading by coach to the Stadium again at Vingis Park this time for the Athletics. GB had 16 competitors competing throughout the day in a wide variety of events. During the morning after a number of events for some of the age groups had finished the medal presentations began. To our surprise and delight Virgilijus Alekna the Lithuanian, European, World and Olympic discuss champion made these. (He still holds the Olympic record of 69.89 meters from 2004). Wow was he big. A gentle man mountain who dwarfed everyone who stood near him. During the afternoon it rained. However, this did not stop the Ball Throw event. Most athletes managed to throw around the 15-25metre distance. It was therefore a huge surprise to the officials when a thin Lithuanian ran to the line and threw 70 metres almost without effort. He then did so twice more just to prove he could. However, we also had a showman in our team, Kes Greenwood in the Shot Putt. He was applauded each time he threw as spectators and competitors alike were impressed by his technique and strength, which of course earned him a Gold medal. Congratulations to our splendid 4x100m men’s relay team in coming 2nd to a red-hot Dutch team. A great race. A great day all round with GB team members again winning a whole bunch of individual medals. The final day saw GB split. 4 went to Badminton, 1 went to Golf while 7 went to Petanque. Some supporters notable Tony Chapman, managed to get to more than one event. Having taken a fistful of photos and posted them and comments on ‘Facebook’ he raced around to support team members elsewhere. Thanks and well done. The Petanque tournament, which is open to all both transplants and supporters, was held in Lukiskiu Square and was organised by the Lithuanian Petanque Association. 20 pistes were laid out and teams of 3 a-side were sent off to play. Referees were available to measure distances and settle disputes. Each team played 5 matches during the day. Both GB Teams won 4 lost 1. The winners, my old friends, were France once again. Joan Whitney, our 7th players was teamed with a young Dutch couple and from what I saw had lots of fun in every game. At the Badminton GB again won through, achieving 3 Golds, 3 Silvers and a Bronze. What a haul. Special mention to Matthew Quinn who as a first timer at these Championships won a Gold (doubles) and a Silver (singles). A great result. Coaches brought the badminton players and supporters to Lukiskiu Square in the late afternoon. Transplants alone then formed a human chain holding hands in a giant ‘Circle of Life’ around a specially prepared heart sculpture. As the music ‘We are the Champions’ was played, not only did they sing the words but as one they moved towards the centre ending up tightly packed around the heart. The mood was one of thanks. Thanks for second life, Thanks to their donor, Thanks for the friendships made and renewed, Thanks for a wonderful Championships. Dry eyes – no chance. So to the Gala Dinner. A spectacular affair in a hotel began with the presentation of the special trophies. Best Sporter male and female, Best sporting lung transplant male and female, youngest medal winning volleyball team and a one-off local trophy presented to the youngest competitor at the Championships. Dinner was served, cameras clicked and conversations began. Before dessert, we were invited outside to witness a display by a dance group twirling burning torches. Back inside once again another huge cake was brought in. A top Lithuanian singer then entertained us until it was time for everyone to crowd the dance floor. All too soon, it was over and we were returned to our hotel. For many the evening had just started and they continued until the early hours. Before we look forward to next time, we should take stock of what we had the privilege of experiencing here in Vilnius. The whole Championships arranged from scratch in around 18 months. A Local Organising Committee formed, A Dream Team found, Volunteers found, support found, money found. A great achievement in such a short time. Congratulations to the LOC, to Vilnius and to Lithuania. Where next ? – Looks like Vaanta in Finland 2016. So get your name down now! Thanks and well done to all the athletes and supporters. It was great to see you all and I am so glad you all had a wonderful time.